The Vietnamese Coast Guard is responding to a cargo fire aboard the container ship APL Vancouver off Vung Ro, Vietnam. It is the latest in a series of container ship cargo fires in recent years, including the well-publicized incidents aboard the Yantian Express, Maersk Honam, Maersk Kensington, Wan Hai 307, MSC Flaminia and MSC Daniela. According to operator APL, the fire started in one of the Vancouver's cargo bays at about 0430 hours on Thursday morning. Video from the scene indicates that the blaze is centered on a container stack located just forward of the accommodations block. At about 0330 hours on Friday, the Vietnamese Coast Guard vessel CSB 8005 arrived at the APL Vancouver's position, and she is now coordinating with the boxship's crew for ongoing firefighting efforts. Commercial salvors have also been engaged and are en route to the site. All 24 crewmembers are reportedly in good health, and no pollution has been reported. The APL Vancouver is a 9,300 TEU container ship built in 2013 and flagged in Singapore. She was under way from Shekou to Singapore at the time of the fire. 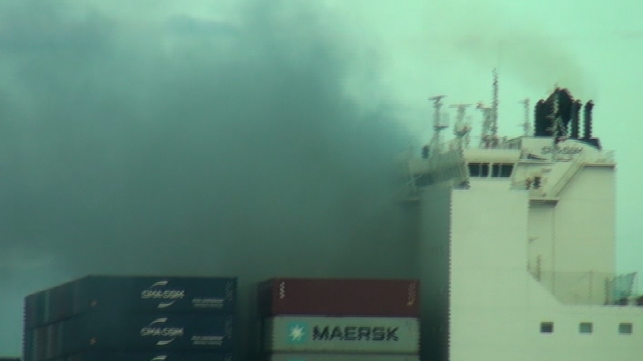 The International Union of Marine Insurance (IUMI) has warned that the design and firefighting arrangements of modern container ships can make cargo fires difficult to address. "Once established, a fire can be virtually impossible to get under control," asserted Nick Haslam, group director of shipping services for LOC, in a recent post for IUMI. "This is because of a combination of factors; restricted access to the cargo stow where many of the fires have started and the sheer size and scale of an ultra large container vessel (ULCV), together with inadequate crew training and equipment."